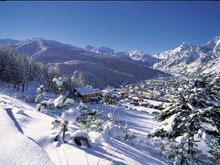 Bardonecchia is found on the Italian side of the Fréjus tunnel, which links Italy and France. It makes an excellent base for travel, as you can drive to both the Trois Vallées and the Milky Way area, providing massive skiing potential. Bardonecchia is a large town, based around the station. It offers good value eateries and accommodation, lovely scenery and friendly locals. It's a short transfer from Turin (90 minutes) but that can mean considerable weekend crowds. The resort takes on two personalities - deserted in the week, overrun at the weekend. This is particularly true of the après-ski/nightlife. The skiing itself is quite substantial, with 140km of pistes. These are shared between three areas, two of which are lift-linked. You'll need a bus to get to all of the lifts. Most of the slopes are geared towards intermediates. Beginners' pistes are quite tough and families with little kids might not find it the most suitable base. The snow can be rather unreliable, as can the lifts, which are quite antiquated. If you are in Bardonecchia during the week, you should find it a very accessible intermediate ski experience. A traditional Italian resort with a decent ski area.